Caroline Lenette is Senior Lecturer in the School of Social Sciences, UNSW Arts and Social Sciences. 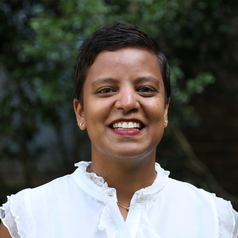 She is a Steering Committee member of the UNSW Forced Migration Research Network. Caroline’s work focuses on arts-based methods in refugee research, the ethics of co-created knowledge, and using participatory research to promote the mental health and wellbeing of people (especially women) from refugee and asylum seeker backgrounds. Caroline is particularly interested in the links between arts-based methods and policymaking. Her monograph on arts-based methods in refugee research will be published with Springer in 2019.